This uniquely designed table was built for a special client in Maine. The table design was inspired by Thomas Monahan and called "Emergence" in the 2008 Fine Woodworking Furniture Issue of 102 Contemporary Designs. The design was changed to meet the taste of the client and is shown in the pictures above. The choice of woods in these photos are highly figured American Black Walnut (MACT-W) with a small amount of white sap wood to give it a distinct look. 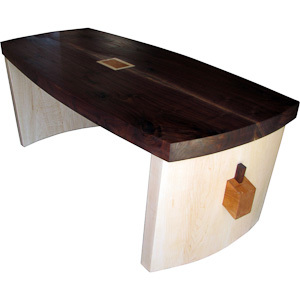 The Rock Hard Maple table legs are splayed inward and are also curved with a through mortise that allows the ends of the Cherry arch to protrude through. The arch is wedge pinned on each end with Walnut wedges. The top has a Cherry inlay giving a faux appearance of a through mortise from the arch below. The Cherry inlay is wrapped with a decorative piece of Birdseye Maple. This table can be made in a variety of other woods. Please inquire.